Harvard’s relationship with Japan dates to the 19th century, to a few years after the island nation opened its doors to the West, and the ties between the two remain strong today. This timeline shows key milestones in that fruitful relationship. As President Drew Faust becomes the eighth Harvard president to visit Japan, faculty members — along with students and alumni — are sending back dispatches about cultural and historical aspects of her trip. The Harvard Graduate School of Design (GSD) has a long history of connections with Japan. The architect Kenzo Tange, a national treasure and Japan’s pre-eminent architect of the modern era, taught at the Design School in the 1970s. The Kenzo Tange professorship was established at the GSD in his honor more than 20 years ago. Following in the footsteps of Tange, GSD alumni from Japan have had a remarkable impact internationally. Fumihiko Maki’s buildings, such as his recently completed Media Lab at MIT, are elegant manifestations of an architecture of restraint. They rely on a deep understanding of space and materials. Yoshio Taniguchi, architect of the most recent addition to New York’s Museum of Modern Art (MOMA), is another celebrated alumnus whose designs are widely admired. The contributions of our alumni, plus the broad appeal and significance of contemporary Japanese architecture, have been the catalysts for many initiatives and programs at the GSD. One of my predecessors, Gerald McCue, should be credited with helping to develop strong ties with Japan, particularly through establishing a number of endowed professorships that were funded by Japanese construction companies. I have always loved Japan and all things Japanese: the architecture, the urbanism, the people, and the food. I particularly like the films of Yasujiro Ozu and his serene depictions of people and spaces. Recently, a group of us from the University had the chance to visit a number of newly completed projects by Japanese as well as foreign architects in the Omotesando area in Tokyo. 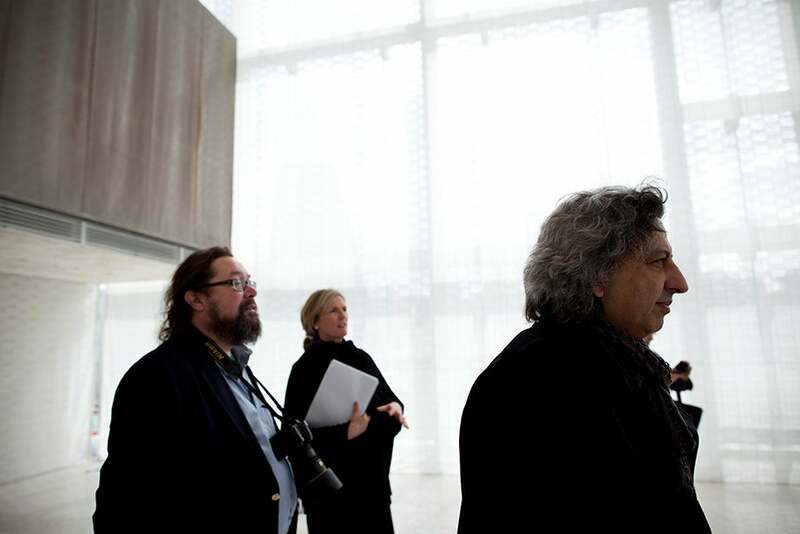 These buildings, all of them for the fashion industry, show an amazing design sensibility. This semester the Japanese architect Shigeru Ban is conducting a design studio at the GSD that focuses on the architecture of disaster relief. Our students have designed and built temporary structures that will be used in Haiti in the areas damaged by the recent earthquake. I am looking forward to our future collaborations with Japan. It promises to be an inspiring journey. 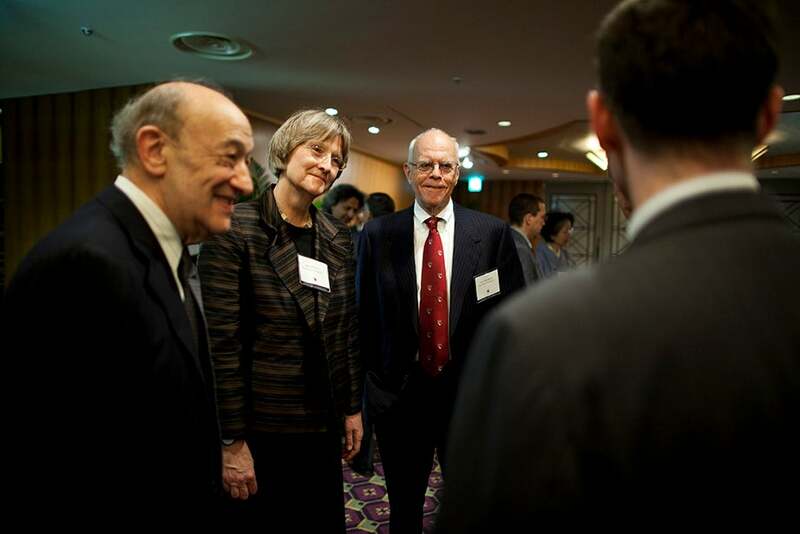 Ezra Vogel, the Henry Ford II Professor of the Social Sciences, emeritus (left), President Drew Faust, and Jack Reardon, executive director of the Harvard Alumni Association, greet guests at the Harvard Club of Japan dinner. The Harvard Club of Japan is more than 100 years old, and Japan boasts the third-largest alumni body outside the United States, behind the United Kingdom and Canada. My first trip to Japan for Harvard was in the 1960s, and I came again with President Neil Rudenstine in 1998. Being here to greet alumni in 2010, nearly 50 years after my first visit, was an opportunity to look backward as well as forward. Earlier tonight President Faust spoke to a packed crowd of 350 alumni at a Harvard Club of Japan dinner held in honor of her first visit to the country, and updated the group on Harvard’s current plans and ambitions, both in her comments and in response to the dozen or so questions she took from the audience. The dinner committee included Honorary Chair Ben Makihara ’54, former CEO of Mitsubishi Corporation; Carl Kay ’78, club president; Paul Tange ’81, M.A.R. ’85, and his wife Denise Tange; and former club presidents Thierry Porté ’79, M.B.A. ’82, and Yuichi Katoh ’61, M.B.A. ’70. Diplomats, business leaders, and academics filled the hall, including current U.S. Ambassador John Roos and former U.N. High Commissioner for Refugees Sadako Ogata. President Faust emphasized the increasingly international nature of Harvard, and answered questions ranging from Harvard’s management strategies responding to changed endowment resources, to the growing importance of the arts and public service in the intellectual and extracurricular lives of our students and faculty, to the importance of teaching students not just to aim high and seek professional success, but also to find time for reflection. A highlight of the evening was Tamako Niva, Radcliffe ’46, offering a birthday toast to Professor Ezra Vogel, a longtime friend of Japan and the author of several books on the region, on the occasion of his 80th birthday. Christopher Clearfield ’05 (standing) asks President Drew Faust a question during the Q&A session at the dinner honoring the Harvard president. 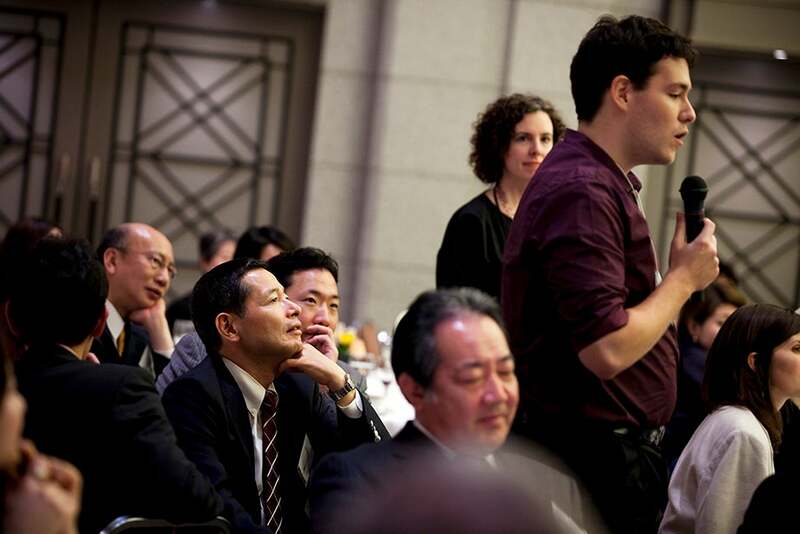 The Harvard Alumni Association, the Harvard Club of Japan, and the 2010 Tokyo Dinner Committee organized the March 16 dinner, which was held at the Hotel Okura Tokyo. The Keio Girls Senior High School is located on the site of a Tokugawa shogun’s residence, and the authentic Japanese gate and stone pagoda evoke memories of the powerful samurai who once ruled here. The samurai are gone, but the young women we met with today exude their own sort of power — a sense of ambition, self-confidence, and assertiveness that stood in stark contrast to many of the female students I encountered when I spent time in Japan 20 years ago. Seated facing a semicircle of 30 or so students and alumni from the high school, President Faust spoke to the group about her role at the University, about the importance of education, and about her own empowering experiences at an all-girls high school and a women’s college. She told them about the notes and letters she received from girls around the world — as well as their mothers and fathers — when she was named president of Harvard in 2007, and explained that, as a result of that outpouring, she has made it a point to spend time during each international trip visiting a girls’ school and meeting with students. She has visited schools from Johannesburg to Shanghai. 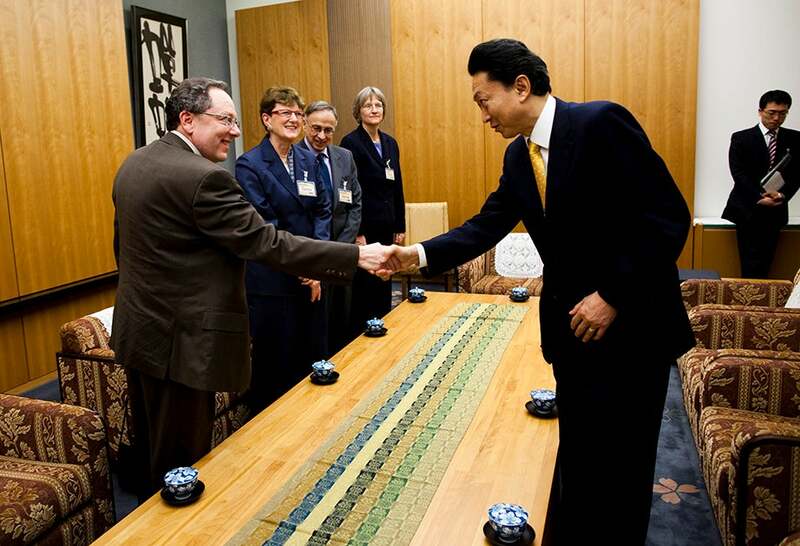 Prime Minister Yukio Hatoyama greets Andrew Gordon (from left), Susan Pharr, Charles Rosenberg, and Drew Faust. A press conference at the National Press Club followed the luncheon at International House, and soon we headed to the prime minister’s office. We met with Prime Minister Yukio Hatoyama, who led his Democratic Party of Japan (DPJ) to power last August, ending the almost unbroken rule since 1955 of Japan’s Liberal Democratic Party. In so many ways, the Japanese political story echoes the Obama saga in America. An appealing leader comes to power with a promise of change, offering hope in a period of economic distress. In the beginning, there is much public goodwill, and approval ratings are high; then the reality of governing in a deeply troubled economy sets in, and the going gets hard. In the face of such difficulties, Prime Minister Hatoyama came off as focused and purposeful. As soon as he sat down, he registered his concern about the drop in the number of Japanese students studying abroad, including in the United States. He spoke fondly of his years at Stanford, where he earned a Ph.D. in engineering; they were among the happiest in his life, he told us. No relation is more important to Japan than the country’s ties with the U.S., he said, and cultural and intellectual exchanges are essential: Japan needs global citizens. President Faust told him about the drop in the number of Japanese students (across all faculties) at Harvard over the past decade, from 151 in 1999 to 101 in 2009. The prime minister and President Faust talked about concrete ways to reverse the trend. The prime minister said several things that meant a lot to me as a scholar in Japanese studies. In the DPJ’s efforts to trim the government budget, some in the DPJ have called for deep cuts in funding levels for Japan Foundation, a government funding agency that is the mother ship when it comes to supporting Japanese studies in the U.S. The prime minister appeared to go out of his way to allay such concerns. When President Faust thanked him for the support through the years from the Japan Foundation for Harvard faculty and graduate students, he volunteered that he wanted to see support for the Japan Foundation maintained. 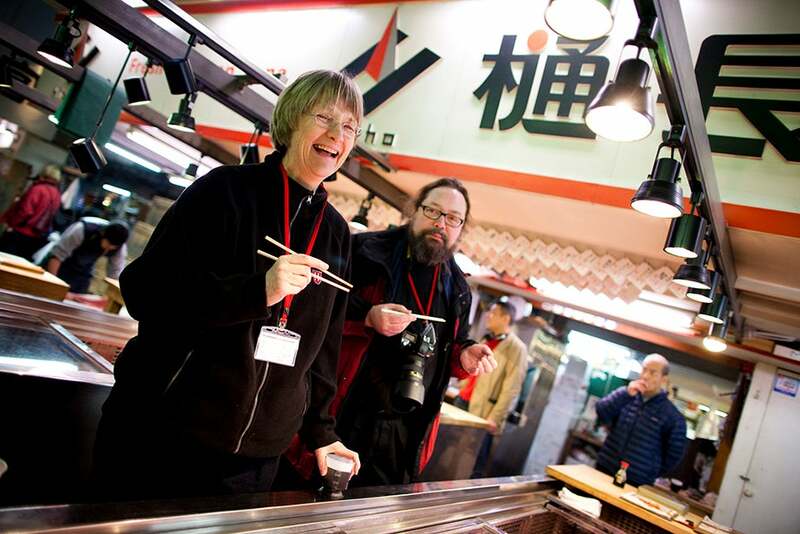 Harvard professors Susan Pharr (left) and Andrew Gordon take a cultural exploration of the shrines and temples of Kyoto. Prime Minister Hatoyama also seemed genuinely interested in Harvard’s efforts to send its undergraduates abroad. President Faust told him about Harvard’s long-term commitment to giving every undergraduate at some point in their years at Harvard a “significant international experience” and said that Japan has been a prime destination. I was delighted that he not only responded positively but said that he would be willing to meet the Harvard students coming this summer. Hopefully, we can find a way to follow up on his generous offer. 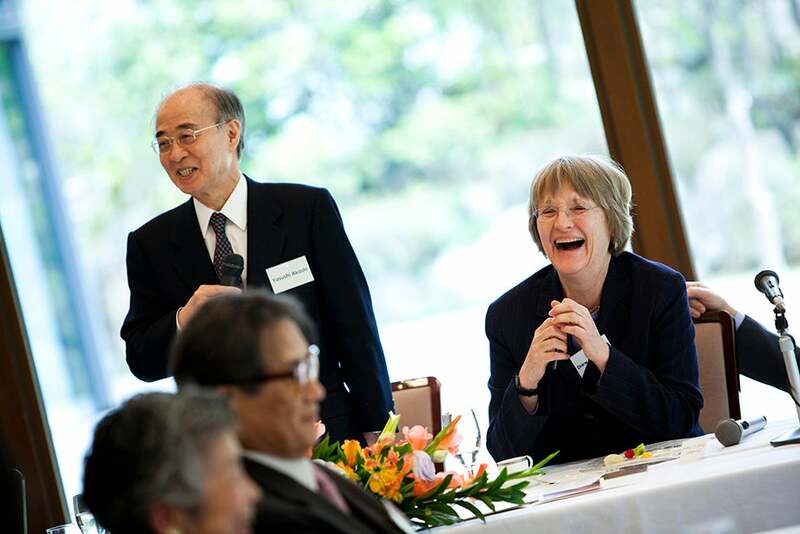 International House of Japan chairman Yasushi Akashi (left) hosted a lunch honoring President Drew Faust. After some brief downtime following our dawn excursion to Tsukiji fish market, we headed to the Roppongi district of Tokyo for a luncheon honoring President Faust, hosted by the International House of Japan. The event, in a conference room looking out on I-House’s spectacular Japanese garden, gave the president a chance to exchange views with university presidents and other leading educators. For me, I-House was familiar territory. There is hardly a scholar of Japan over the past 50 years who hasn’t stayed in one of its guest rooms or taken part in its seminars at some point. Presiding at the event was I-House chairman Yasushi Akashi, a distinguished diplomat and former U.N. civil servant who is an inspirational figure for young Japanese eager to play an international role. He was a superb moderator, and the session turned out to be one of the intellectual high points of the trip. The topic was how colleges and universities should go about creating global citizens. After some opening remarks from President Faust, a far-ranging discussion ensued. One issue we’ve heard about throughout the trip got a lot of attention: Why is the number of Japanese students studying abroad declining, when global trends are in the opposite direction? One participant commented that at her institution, even with ample scholarship money available, it is sometimes hard to find takers. Young Japanese are inward-looking and prefer comfortable lives in Japan to venturing overseas, some said. But others saw economic uncertainty as the driver: Students are focused on getting jobs after they graduate, and can’t see the payoff from earning a foreign degree. Small family size could be a factor; parents are reluctant to see an only child study outside Japan. It was gratifying to see so many educators concerned about the problem, even if they did not agree on the causes. President Faust described Harvard’s own internationalization efforts, from Harvard’s role in earthquake recovery in Haiti to its public health collaboration in Japan with Teikyo University. She also talked about Harvard’s goal of giving every undergraduate a “significant international experience,” i.e., at least eight weeks abroad involving a meaningful cultural encounter. Almost 100 Harvard College students went to Japan last year, she told the leaders, and roughly 25 percent of the undergraduate class now has significant time abroad each year. As another aspect of internationalization, she also spoke of the value of having faculty from abroad; “talent has no national boundaries,” she said. Several attendees commented on how few four-year, coed universities in Japan have women presidents, and said how much Faust’s appointment as Harvard’s president had meant to them. One president of a women’s college asked President Faust, a Bryn Mawr graduate, how she had seen the relative merits of attending an all-female institution versus a coed school. In the era in which she grew up, President Faust replied, attending a girls’ high school and a women’s college were the right choices for her; at a coed institution, she would have encountered few women in front of the classroom and in leadership positions. 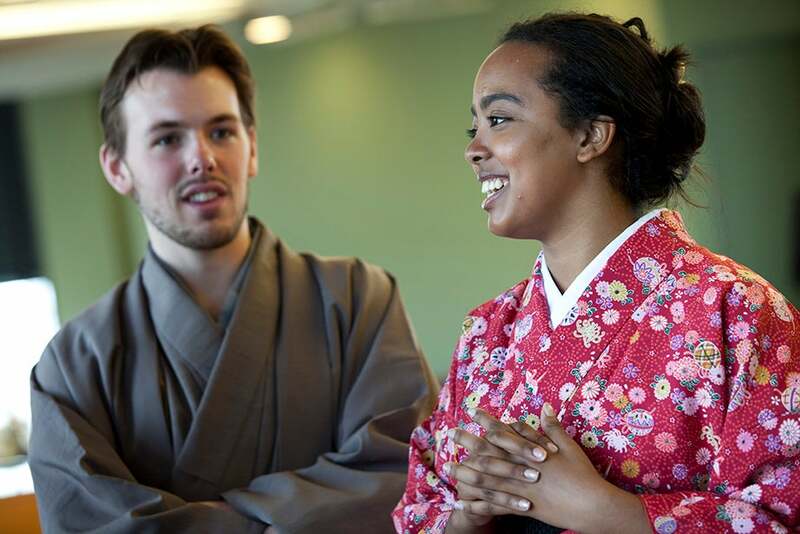 James Noyes ’11 (left) and Iddoshe Hirpa ’11 greet President Faust in traditional kimono dress. I’ve been in Japan since last June wrestling with one of the most essential aspects of human existence — language and communication. This is an overly grand-sounding statement but you don’t realize how truly critical and fundamental human communication is until you put yourself in a setting where you cannot simply freely express yourself. In the short term it is a frustrating process, but in the long term the reward of a whole new language to express oneself in is invaluable. At the Kyoto Consortium for Japanese Studies, most students are not here for such an extreme language experience as much as they are for a new cultural experience, but my goal is distinctly to have a lifestyle that incorporates the use of both fluent Japanese and English. Thanks to KCJS’s language education, which is the very best I have ever experienced, I am growing closer and closer to that. In addition, the setting allows for plenty of opportunity to interact with the vast student population of Kyoto, especially the students of Doshisha and Kyoto University, considered two of the top universities in Japan. I’ve become close friends with several of these students and from them have heard many thought-provoking viewpoints quite different from my own. This has vastly expanded my worldly views and more than anything taught me about what it means to be both a Harvard representative and an American university student. Thanks to the generous support of the Reischauer Institute of Japanese Studies, before coming to Kyoto this spring to study, I had the chance to live in Yokohama and Tokyo the summers after both my freshman and sophomore years. Because of these experiences, I foolishly thought that living in Kyoto would be a piece of cake. However, Kyoto, Japan’s ancient capital, is a world apart from the bustling metropolises of Yokohama and Tokyo. In a city where an invitation to come up for a cup of tea once meant that your host wanted you to pack up and leave, learning to read social cues has definitely been my biggest challenge as I go about my life in this city. Like any other Harvard student, however, I relish the challenge of living in a place that can be so mind-boggling at times. And I was also happy to hear that soon many other Harvard students also will get the same chance. This year the Harvard Summer School will host a program at Dōshisha University, which is located just north of Kyoto’s Imperial Palace. Our group from Harvard had been outfitted with the rubber boots worn by regulars, and we watched as the auctioneers went over their manifests and prospective bidders examined the hundreds of tuna laid out on wooden pallets, each fish carefully arranged in order of quality (and hence expected price) from highest to lowest. The tuna carcasses have their tails cut off, so that buyers can look at something like a tree-ring of the tuna’s internal structure, and rub bits of the meat between thumb and forefinger to judge the fat content. At 5:30, the auctioneers from several different companies rang hand bells loudly to start their auctions (four auctions for fresh tuna go on simultaneously, spread across a space about the size of two basketball courts). Each auctioneer had his own vocal style — rhythmic cadences to call the lots, solicit bids, and announce the winning bid on each fish — as well as his (they are all men) own body language as they move along the lines of wooden pallets. Drew commented on the almost symphonic quality of the sound. Mr. Iida, the now retired 7th-generation proprietor of a shop that specializes in tuna, pointed out that of the hundreds of tuna on display, only three were wild caught fish, all the others were farm-raised (that is, fattened up in the tuna equivalent of feedlots). He pointed at what he thought was the best of the wild tuna and said it would probably bring Y15,000 per kilogram ($167); I checked with him after the auction and he was almost precisely on the money; it sold for Y14,500 ($161) per kilo. He and others we encountered talked about the anxiety in Japan and the global tuna industry about the international proposals that will be taken up next week to ban the trade in Atlantic bluefin tuna, a mainstay of Japanese sushi consumption. Talk on this was grim. Who is responsible for overfishing? People in the Japanese fish business feel they are being singled out as responsible for a crisis in global resource management. We visited Mr. Iida’s stall half an hour later, where he and his son, now the 8th-generation proprietor of a shop that opened in 1861, explained the different kinds of tuna they were selling, beneath a display of shipping tags for their deliveries to 150 of the finest sushi restaurants in Tokyo. Suddenly, a couple of platters of tuna sashimi freshly sliced from blocks of tuna that sell to sushi chefs at upwards of $300 per kilogram appeared before us, and Drew, who is not normally attracted to raw fish, sampled a few slices. President Drew Faust and Harvard faculty meet with Dōshisha University President Eiji Hatta during the second day of their trip to Japan. Today’s main event was a lunch-time symposium on American studies in Japan. 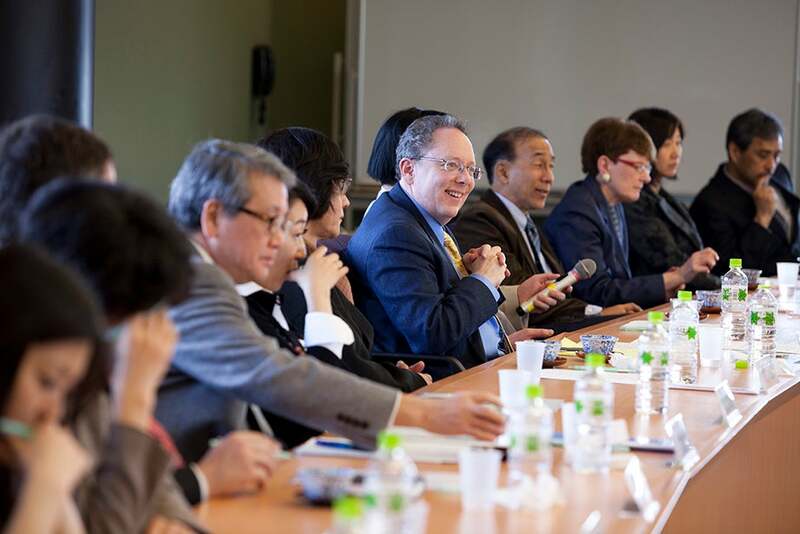 This was a chance for President Faust to compare notes on recent intellectual currents with Japanese faculty and graduate students in her own academic field. The event was hosted by Dōshisha University. Neejima Jō, one of the first Japanese to study in the United States, graduated from Amherst College in 1871 and returned to found this school. Marking this continuing connection to New England is an elegant brick structure, Amherst House. As Dōshisha’s President Hatta greeted President Faust in the grand living room of the house, I was greeted by a rush of emotion. I suddenly remembered the other time I had been in this room, on my first trip to Japan. It was the first day in Kyoto for our group of eight high school students on a summer study program, also hosted by Dōshisha. In this room we were introduced to our host families and welcomed to Kyoto. I have been back to Kyoto many times, and to Dōshisha on a number of occasions, but never returned to Amherst House itself. As President Hatta and his colleagues described to President Faust their university’s initiatives — not unlike those at Harvard — to develop a more globally embedded program in American studies and projects linking in medicine, life science, and engineering, my own thoughts kept sliding back to the summer of 1969. The luncheon that followed brought together scholars from universities in Kyoto, Nagoya and Tokyo. We learned of the impressive intellectual ambition, range and depth of the work being undertaken by graduate students and faculty alike. Particularly prominent were studies focused on questions of race and gender, war and peace, both in American experience and more broadly. Over coffee and dessert after the formal discussion, two Harvard undergraduates studying at Dōshisha this semester joined us. To our astonishment, they wore kimono. This was not purely a fashion choice. March 14, it turned out, is kimono day in Kyoto, and wearers were entitled to discounts in museums, stores, and taxis! Kyoto is a living museum of Japanese history and culture reaching back more than 1,200 years. Home to some of Japan’s finest universities, it is also a lively hub of higher education and knowledge industries. 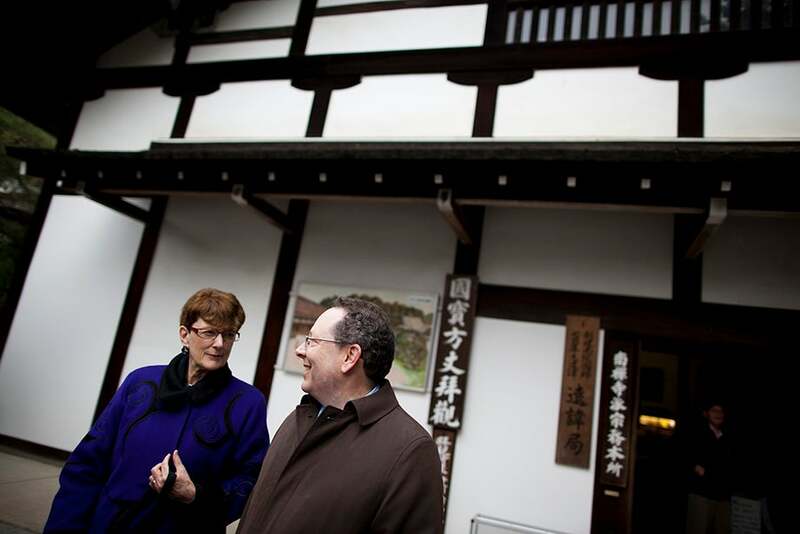 For a university president who is also a historian, it is a logical first stop on her first visit to Japan. Our first day began with a tour of the Nanzenji temple, one of the most important centers of Zen Buddhism since the late 13th century, followed by a stop at the Silver Pavilion, both set in the quiet of the city’s eastern hills. We got a powerful sense of the continuing privilege attached to the imperial family of the modern nation during lunch at the Yoshida Sanso. Now an inn and restaurant, it was built in 1932 by the parents of an imperial prince, who enrolled that year as a first-year student in Kyoto Imperial University. A splendid two-story structure atop a hill beside the campus: nice digs for a college student. The prince (Fushimi no Miya), we learned, was now a retired priest, exactly 100 years old. One odd highlight of the afternoon visit to the stunning gardens of the Shugakuin Imperial Villa was the electrified fence, designed to keep out wild boars and monkeys. These animals still live in the adjacent hills, and are more aggressive than humans in their efforts to “vandalize” imperial property. The day concluded with a sumptuous Kyoto-style dinner (vegetarian and fish cuisine) hosted by Kyoto’s Mayor Kadokawa, along with the president of the Kyoto city council, Mr. Shige. Both men had visited Boston and Harvard this past August to mark the 50th anniversary of the Boston-Kyoto sister city relationship. As dinner ended and President Faust offered the Mayor and City Council President gifts sent from Boston Mayor Tom Menino, they offered President Faust some impromptu pitching instruction, just in case she has the opportunity to throw a first pitch at a Red Sox game some day. Timeline source: The Harvard-Japan Project is a research effort by Susan J. Pharr, Edwin O. Reischauer Professor of Japanese Politics, director of the Reischauer Institute of Japanese Studies, and of the Program on U.S.-Japan Relations at the Weatherhead Center for International Affairs. Mari Calder played a central role in the project, and a book is forthcoming. 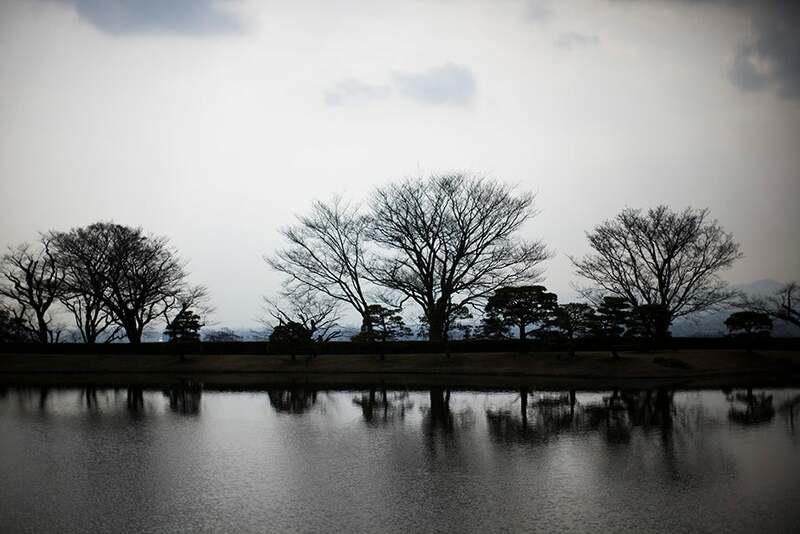 The project is based on archival work and interviews in Cambridge, Washington, D.C., Tokyo, and Kyoto, Japan. In 2007, Harvard researchers Hugo Garcia (from left), Reina Flores, Vicky Karas, Barbara Fash, and Citlali Sanchez were in Yaxchilan, Mexico, bringing new technology to the archaeological site.